With the Columbia Series 910 Thermal Break Fixed Lite Aluminum Window, Columbia offers a problem solving versatile picture window that puts economy, quality construction and aesthetic excellence into your building plans or home. Columbia thermal break primary aluminum windows have versatile design with a large variety of uses, ranging from single dwellings thru multi-family units to institutional and commercial construction. There is no doubt that Columbia has the industry’s finest constructed, most attractive and adaptable prime window there is to offer. 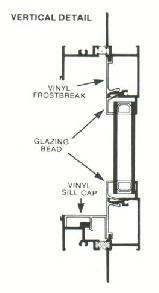 General: All of our Aluminum Thermal Break Series 910 F-R40 Stationary Windows shall comply and bear the Quality Certification label in accordance with the ANSI/AAMA Certification Program 101-93. Material: Series 910 aluminum windows frames and sash members shall be of 6063-T5 extruded aluminum alloy having a minimum thickness of .062″, the sill to have a minimum thickness of .062″ within commercial tolerances. Integral fins to have suitable break-off and nailing grooves. Construction: All joints of frame and sash members shall be neatly fitted, securely connected and permanently watertight. Frames shall have step point construction for maximum rigidity. Both frames and sash members shall use an extruded screw boss that is an integral part of the extruded section. Mullions to be furnished as required. Fixed sash glazed drop in type.